Dasung's Not-eReader is an Android-based 7.8" E Ink (300 PPI) smart tablet-like device. Dasung claims the Not-eReader will have a video-capable fast refresh rate. Other features include a large 5,300 mAh battery, a quad-core CPU, 2GB of RAM and 64GB of storage. Dasung launched a crowdfunding campaign for the Not-eReader. The device will cost $465, although early buyers will get a 26% discount. 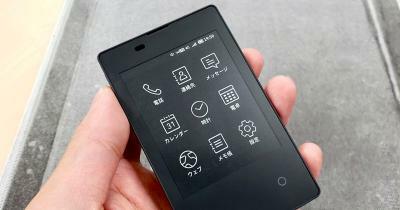 NTT DoCoMo's Card Keitai is the company's lightest phone ever at only 47 grams, and it features a single 600x480 E Ink display. It's a feature phone (cannot add applications) that supports simple functions. The Card Keitai will ship in Japan by the end of November 2018 for around $280. According to report, Amazon decided to shut down Liquavista - an e-paper developer that it has acquired in 2013. It is not clear yet whether Amazon decided to discard the technology, or whether it has moved the technology to another part of the organization. Liquavista was established in 2006 as a spin-off from Philips, with an aim to develop its Electrowetting technology, which can be used to develop full-color and video-capable e-paper displays. Liquavista was acquired by Samsung in 2011, and in 2013 Samsung sold it to Amazon. Waveshare is offering a wide range of E Ink displays for Raspberry Pi, and the company has now added 7.5" display option. The 7.5" E Ink display offers a resolution of 640x384, and can support either 2 colors (black/white) or 3 colors (black/white/red). The display costs $65 for the black and white version and $77 for the 3 color one. 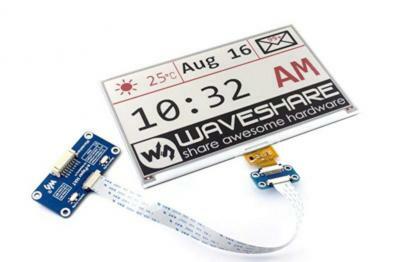 Waveshare is now offering E Ink Raspberry Pi displays ranging from 1.54" to 7.5" in size. All of these displays are available on Amazon.com. Visionect posted an interesting interview with Russ Wilcox - the founder former CEO of E Ink. Russ discusses the early days at E Ink, the sell to PVI, the signage market and more. 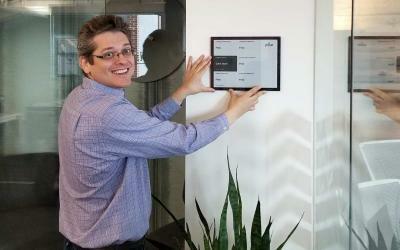 Russ believes that the new color e-paper displays will "open up a large market for advertising". Read the full interview here! ynvisible was established in Portugal in 2010 to develop flexible transparent electrochromic displays produced using a simple printing method. In 2011 the company started producing sample products (we tested one in August 2012). Fast forward to September 2018, the company has gone through a reverse take-over, and the now Canadian headquartered Ynvisible Interactive Inc. has inaugurated its new production line near Lisbon, and we had an interesting discussion with the company's CEO, Jani-Mikael Kuusisto who updates us on the company's technology and business. ynvisible is focusing on developing the inks that are used to print these relatively simple displays for use in everyday consumer goods and printable surfaces. The electrochromic displays are cost-effective and highly energy-efficient. The company used to have a capacity to produce a few thousands of displays each month, but the new production facility can produce hundreds of thousands of displays each month. 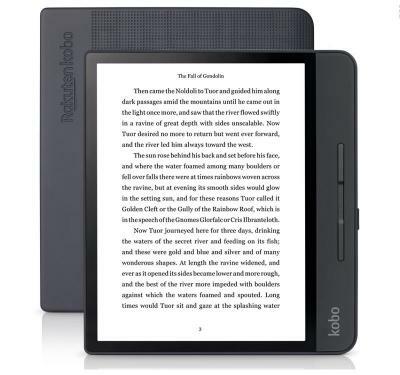 Kobo's Forma is a large-sized premium e-reader that features a 8-inch 1440x1920 (300 PPI) E Ink Carta display, 8 GB of storage and an LED front light. The Forma is waterproof (IPX8). The Format will launch on October 16 for $280. Atrohaus' Traveler is a portable writing device that is designed for distraction-free writing. 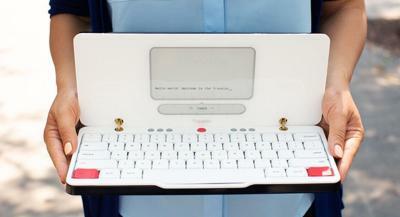 It has a 6" E Ink display, keyboard and WiFi and can last for about 30 hours (about 4 weeks of 30 minute a day). The Traveler is now available for pre-order on Indiegogo for $309. The full retail price will be $599. Asrohaus aims to ship the first devices in June 2019. 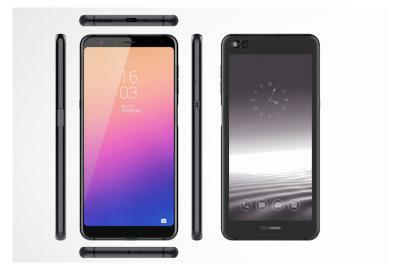 The HiSense A6 is a dual-screen smartphone that features a 6.1" 2160×1080 AMOLED display on the front and a 5.6" touch E Ink Carta HD screen on the back. Other features include a snapdragon 660 chip-set, 6 GB of RAM, 64/128 GB of storage and a dual-sensor 12Mp camera. The E Ink display can mirror the front display, which can then be used to run an e-reader application or any other application. The HiSense A6 will ship by the end of November 2018, the price will be around €499 in Europe.